"How can traditional radio better compete with digital media?" That is the main topic at an increasing number of Bridge Ratings' radio clients. How to read: 88% of respondents mentioned videos as the number one type of digital content that radio stations could add or increase, increasing from 75% in 2/2017. "Personalized content I can choose", "Live Chats" and "Gifs" were along among the top five highly preferred. 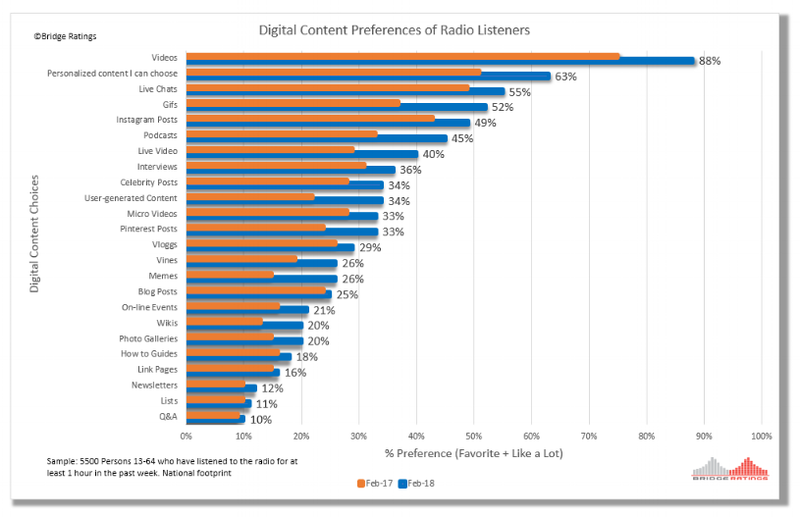 In a just-completed study on all-things digital as it relates to radio listeners, we are learning more about what listeners to our radio stations want. Radio can take some lessons from the digital playbook, lessons about how digital media positions itself against traditional media and how to counter those tactics. The following is a brief overview out of digital media's positioning playbook which is used extensively to counter traditional radio during sales calls as well as inside digital media companies seeking to outflank traditional media to increase users as well as revenue. 1. POINT : "It is perceived that Traditional media only talk at its audience while digital media allow for conversations. Since its inception, advertising and content were largely one-way streets, seeking only to get a message or content in front of an audience. Traditional client marketing often includes calls to action, but most advertisements are uninterested in a dialogue. Accordingly, consumers are becoming increasingly uninterested in those "one-way" messages, shifting their attention to media — primarily social media — that encouraged them to have their say." COUNTERPOINT : Radio can slow its time-spent attrition with engagement strategies which elevate brand as well as promote listener involvement on-air. Radio can no longer put its efforts simply into raising awareness about its brands. Historically, traditional media has offered great options to advertiser. However, whether your content is talk or music-oriented, consumers want to be more engaged with you on social media and other digital media where conversations are just a click away. 2. POINT : "Traditional media is perceived to be only available on a set schedule; on-demand is a key digital media strength. While there’s something to be said for the anticipation that comes with looking forward to a 10:07 contest, the 7 o'clock countdown or the top of the hour news headlines, digital media takes advantage of its watch, listen or read what you want, when you want." COUNTERPOINT : Radio already does a pretty good job of using digital media extension as a means to promote immediacy. Daniel Anstandig's Futuri Media offers excellent tech solutions to radio to enhance on-demand and "plugged-in with consumers" tactics. Programming that is consumed "as it happens" is a radio strength and station operators can enhance engagement by offering more "as it happens" content. News Radio does this well and promotes it effectively. Music radio has such tremendous resources most digital media companies don't have that offering frequent "live" content which appeals to the core of your audience can increase daily tune-ins and cume, keys to improved ratings. 3. POINT: "Digital media strategists know that marketing via traditional media is all about interruption so digital marketing has amped up its value proposition in which the audience can opt in when it fits with their personal schedule." For advertisers targeting has never been more important — and never more possible. While traditional media has based effectiveness on audience demographics, digital media allow for much greater sophistication, using strategies like modeling and remarketing to minimize waste. In addition, advertisers have the option of putting resources into opt-in forms of marketing, including organic social media and email marketing, combined with content that’s more engaging (see No. 1 above) where they can be more certain that the message will not be seen as a nuisance. COUNTERPOINT : Radio has access to these same targeting tools with a great advantage: proven loyalty. Radio has a built in audience which has been nurtured. Listener databases, lifestyle audience characteristics can be applied to Nielsen metrics to bolster radio's targeting capabilities. Cluster analysis also empowers radio strategists with tactics in which to reach radio listeners with increased listening potential. While digital media may boast about potential consumer targeting effectiveness. traditional radio not only reaches mass audiences, but its digital tech provides a way to carve out highly focused format-appeal among listeners. The recently released Q2 2017 Nielsen Comparable Metrics Report offers an in-depth apples-to-apples comparison of major media platforms—traditional radio, television, computers, smartphones, game consoles and tablets. Each week, more Americans tune into AM/FM radio than watch television, or use smartphones, tablets or computers. At the same time, streaming audio offers consumers even more ways to listen across many of those same devices. 4. POINT : "It’s hard to measure the impact of traditional media; it’s comparatively easy to measure the impact of digital. While it’s true the impact of digital marketing can’t always be measured, it’s much easier than measuring the impact of traditional media. It can’t be done without effort, but it is very possible to know which messages resonated and lead to a specific action". COUNTERPOINT : Digital Media Waste. After ten years or more of advertising agencies realigning ad budgets in order to place more into digital platforms, media waste is a "thing". Procter & Gamble chief brand officer Marc Pritchard, who holds the strings to the conglomerate’s $2.4 billion annual U.S. advertising purse, threatened to yank his company’s spend if P&G's digital ad partners failed to address the growing mess of issues in digital advertising like fraud, brand safety and transparency. Pritchard points to at least 20 to 30 percent of waste in the media supply chain because of lack of viewability, nontransparent contracts, nontransparent measurement of inputs, fraud and ads showing up in unsafe places. Radio's ad effectiveness has been tested and proven for decades, most notably at the local level where local business can experience foot traffic increases and on-line purchasing engagement from their radio station partners. While traditional radio has made significant progress adapting to the world of digital competition, a more aggressive approach is needed to offset the consumer usage momentum of the last few years. As explained in Bridge Ratings' "New Media Gauntlet" analysis here, there has been an onslaught of new audio and entertainment competition since 2000. Use of traditional radio by young adults (see chart) has primarily impacted time-spent. This chart (18-34 year old adults) reveals the core of the momentum digital media is building over time as it pertains to traditional radio consumption. While the trends are less dramatic for those over 40 years of age, we are now seeing increasing use of platforms which offer customization and personalization of entertainment content. Personalization may be a tactic for radio which can offset some of the attrition. National Public Radio has done an excellent job of realizing the need for such customization of their content and they have successfully transitioned much of their audience to combine use of both traditional and digital media. Bridge Ratings President, Dave Van Dyke, offers an interesting tactic in this short audio piece. Your feedback and comments are welcome.